John Deere Tractors are manufactured by a company with roots in the mid 1800's. Here is a story about the early years before farmers had tractors to help work their fields. The ingenuity of a tall, broad shouldered, frontier blacksmith is playing an important part in feeding a hungry world. At no time in history has the demand for food been so great. More soil is being tilled than ever before. No farming implement is more essential than the plow. 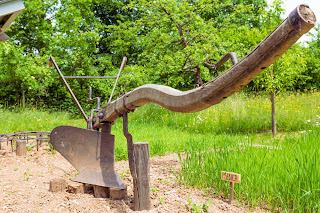 The use of the plow dates back as far as recorded history but it was not until 1837 that a 33 year old American blacksmith by the name of John Deere made the first self-polishing plow, and since that time no definite improvements have been made to his original plowshare. Before the era of the self-polishing plow, a farmer was fortunate to plow an acre a-day; it was necessary to spend much of his time cleaning the plowshare so that it would cut and turn the soil. The average farmer will now plow this much with a single-share plow and a team in half a day or less. With a gang plow and tractor he may turn over an acre of sod in an hour. Back in 800 B. C., the Prophet Joel advocated beating all plowshares into spears for defense against the enemy. During the war years we did much the same — the only difference being that the factories used the plowshare steel in making parts for tanks, airplanes and battleships. But again, as in Biblical days when Isaiah wanted the swords beaten back into plowshares, our factories turned to making farm implements. Theology students differ regarding the type of plowshares mentioned in the Bible. Some believe they were made of bronze. It is an era regarding which we have few facts. Records show that the first iron plow in America was produced by Charles Newbold in 1796. He spent a small fortune in developing his cast-iron plow but reaped no dividends nor glory. For some reason the farmers conceived the strange idea that such a plow poisoned the soil, encouraged weeds and impaired fertility. As the years passed the notion wore off and other inventors continued from where Newbold left off, Thomas Jefferson, who was versatile, experimented with a moldboard to turn the sod. Even Daniel Webster took time from his oratory and senatorial duties and fashioned his idea of a plow. Men in all types of life were interested in an earth-turning implement. The progress of a new nation depended upon its work. The wooden and cast-iron plows were used with fair satisfaction on fields which had already been worked. These fields had loose dirt which fell away from the share and moldboard. The real difficulty came when the people moved westward to settle on the prairies. They found the virgin soil composed of a sticky muck which,instead of falling away, stuck in gobs until the plow could no longer move. Like many other adventurous men John Deere traveled to the frontier, taking his blacksmith tools with him. Each day in his ship he listened to the trials and tribulations of the settlers who found it impossible to prepare enough land to sustain their families. Some were planning to go back East. He felt that if only they had a plow which would scour as it cut through the earth their trouble would end. The words "a plow that scours' continually ran through the mind of the perspiring blacksmith as he pumped the bellows and hammered red hot iron. The forefather of the John Deere tractor was a hard working, practical man. His thoughts were always on present needs. Could a plow be made that would scour as the frontiersmen desired? Could it be possible for a blacksmith to make such an implement? He decided to work out the answer for himself. Before we go further, let us turn to the village of Rutland, Vt., in 1804. Here a son was born to Sarah and William Deere. He was named John and he lived in the community through boyhood and until after reaching voting age. His father, who was a tailor, had come to the United States from England. His mother was the daughter of a British soldier who fought the Yankees in the Revolutionary war but stayed to become a citizen. When John was 8 years old his father decided to return to England to purchase goods for his tailor shop. Before going on the boat he posted a letter to John, the youngest of his 4 children, asking him to take good care of his mother. The letter, which was quaint and formal, was the last word the family received from him. His luggage arrived in England but he was not aboard when the ship docked. The reason for his disappearance always remained a mystery to the widow and children. Sarah Deere continued to operate the tailor shop. She wanted John to continue in school and become an expert bookkeeper. He attended Middlebury college for a brief time but school did not offer what he wanted for his mechanically inclined mind. He got a job as an apprentice with Captain Lawrence to learn the blacksmith trade. Here he learned how to forge the tools needed for the maintenance of life. Young John helped shoe the oxen, making the metal shoes, even the nails. He did theiron work on wagons, stage coaches and on fancy carriages, for the well-to-do. John proved an apt apprentice, so Captain Lawrence gave him the highest wages paid to apprentices in those days — $30 for the first year and $35, $40 and $45, respectively, for succeeding years. Upon completing his apprenticeship and reaching the age of 21, the young blacksmith hired out at $15 a month. After his marriage he spent his evenings making shovels, hoes and forks for extra money to help raise his family. Vermont farmers drove for miles to buy his products because they were sturdy and handled easily. Tales of the western frontier reached the Vermonters. The stories of adventure inoculated John Deere like many others with a desire to travel to the wild lands beyond the horizon. Some wanted to own spacious farms with fertile acres but John Deere's dream was to operate his own blacksmith shop in the frontier country. Land hunger was universal. Wealthy people purchased large tracts to hold for the rise that an influx of population was expected to bring. George Washington was among the speculators, at one time owning 200,000 acres of western land. The man who financed the Revolution, Robert Morris, bought millions of acres and sold on an advanced market, making him the 2nd richest man ' in America. It seemed the wildest dreams were coming true. The people of Vermont had all heard of Gurdon Hubbard's good luck after leaving Vermont for a new city on the lake called Chicago. He became part owner of an 80-acre tract which was surveyed into lots, A few months later his half interest sold for $80,000. John Deere filled the family pantry in 1836 and started westward alone. Chicago's population was less than 4,000 people. There were 398 dwellings, 19 grocery stores, 26 saloons, 17 lawyers' offices and 5 churches. After arriving in Chicago John Deere decided to travel farther west although there was no blacksmith shop in Chicago and they wanted him to stay. He arrived at Grand Detour, an Illinois settlement founded by Vermonters 100 miles west of Chicago, with a box of tools and $73 in capital. Right from the first the new blacksmith had all the repair work he could handle. He built a cottage near his shop in spare time and then sent for his family. The blacksmith's 3 daughters and son jumped from a covered wagon and ran to meet him. Next appeared his wife, Demarius, who handed him a bundle as she stepped from the wagon. "What's this?" he asked as the bundle squirmed in his strong, bronzed arms. "A surprise, John!" She smiled, "I want you to meet Charles - your new son." The West continued to grow. New Englanders by the thousands packed up their belongings and headed for the sunset. Each ship to the New World brought people from Germany, Ireland and particularly the Scandinavian countries. The lure and promise of the frontier continued to bring people to Chicago, many continuing westward to secure free land. Settlers were having trouble turning the sod. As they followed their plows and ox teams they had to carry a wooden paddle to scrape the sticky dirt from the plowshare so it would stay in the ground to make a furrow. The farmers complained, saying the prairies would never be farmed successfully until a plow was made that would scour. John Deere loved his new home and realized if this word went back East the frontier would die and he would have to return to Vermont and make hoes and pitchforks. He did not relish the idea of being known as the best manure fork maker in Vermont. Night after night he could be heard hammering after 10 o'clock and again before 4 o'clock in the morning. The sad part was that none of his remodeled plows worked any better than those brought by the settlers. One day he went to a saw mill to make repairs. While there he noticed a glistening circular saw blade, polished by the friction of the wood and an idea was born—one that has affected every person in the civilized world. The blacksmith returned to his shop carrying a heavy discarded saw blade made of imported Sheffield steel. He was eager to make a plowing test to see if soil, even sticky black prairie muck, would slip past the point and fall away from the curved moldboard. John Deere was no paper and drawing board mechanic nor was he a dreamer. The frontier blacksmith was not thinking of a personal future or of a company that would sell his plows. He was thinking of the farmers living around Grand Detour who told their troubles in his shop. He started to fashion the plow he had conceived in his mind when he first saw the bright piece of steel. The settlers of the neighborhood heard that the blacksmith was making another plow. They were skeptical but hoped his latest attempt would be a success. He cut the worn teeth off the mill saw with a hand chisel. He carved a wooden model of the one-piece share and moldboard and patiently formed the steel over it. It was necessary to heat a little at a time, shaping it the best he could over the form with a wooden mallet to avoid denting the surface of the metal After making the upright standards of iron, he went to the river bank and dug up a sapling and used the crooks of the roots for handles. He took an axe to shape a beam out of a fence rail. Finally the new plow was finished. Several farmers and villagers were out to witness the test. Lewis Crandall's farm near the river was known to have the stickiest soil in the community. 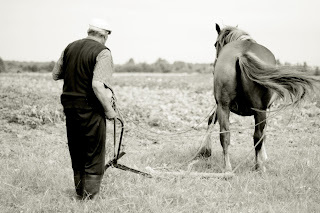 The owner offered to supply the horse to pull the plow. The blacksmith carried the plow across his shoulder to the field where the group waited. The new plowshare reflected the rays of the sun like a mirror. Crandall hitched his horse to the plow and slapped the reins on the horse's back. The test was on. The blacksmith spat on his hands and gripped the handles as the glossy plowshare dug deep into the sticky soil. The horse pulled harder. The spectators trudged behind. Even the most skeptical were silent; all were watching and wondering. The soil began to cut and curl from the steel moldboard in a neat ribbon-like strip, leaving a smooth furrow. At the end of the field the plow was pulled from the soil. The steel moldboard was as clean as when they started. "No need for a paddle with this plow, a lanky frontiersman said as he rubbed his hand across the steel, "It polishes itself." The blacksmith wiped the perspiration off his brow and a smile of satisfaction crept across his tired, weather beaten face. His mind quickly visualized the words "self-polishing," a name he selected for his plow, printing it on top of each beam. So ended the test of the world's first self-polishing plow. A memorable occasion in the history of agriculture. At first the blacksmith used discarded saw blades from the saw mills as there was practically no other steel available. Procuring the material was a new problem. Records show that John Deere built only one other plow in 1837. During the following year he built 3. In 1839 he increased his production to 10 plows, the output growing until he was able to deliver one each week, at $10 f.o.b. his Grand Detour blacksmith shop. 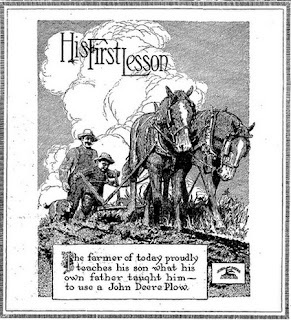 Finally John Deere located a firm in England which offered to supply him steel for his plow. The transportation fee added to the material brought the cost of his first shipment to $300 a ton, far too expensive to be used in plows for frontier farmers who had little money. In addition to the high cost of this first shipment he had a major manufacturing setback when it was discovered that the steel from England was badly pitted by rust, depriving it of its self-polishing quality. He then resolved to arrange somehow to obtain the needed material in America. He had heard of the wonderful things done with metal in Pittsburgh so he made the trip. One of the companies listened to his story and agreed to supply him. So the first steel rolled in the United States for plow making was made in Pittsburgh for John Deere and delivered in the spring of 1846. John Deere ran into one difficulty after another. He next encountered financial troubles in getting his new business into operation. Nine years had already passed since he had made his first self-polishing plow. He was now 42 years old. The blacksmith looked about for another site where distribution would be better and raw materials such as coal and wood readily available. He selected Moline, moving farther west to keep up with the frontier. This would give him a larger territory and better shipping facilities, using the Mississippi river boats to Keokuk, Muscatine, Burlington and Dubuque. His raw steel from Pittsburgh was contracted for delivery to Moline. John Deere spent the next 10 years at the anvil.. He loved the feel of the heavy hammer in his hands, the smell of smoke from the forge and the sight of flying sparks. But with the influx of orders he had to devote more time to the business end. The number of employees steadily increased; the business grew. In 1852 the sales reached 4,000 plows. Soon they leaped to 10,000. The frontier continued to expand north, west and south and wherever settlers went John Deere self-polishing plows went, too The reputation of the skilled frontier blacksmith penetrated the remotest parts of the country and to nations across the seas. Moline became known as the plow capital of the world. The Vermont blacksmith, who died in 1886, lived to see his self polishing plows turned out by the thousands to help produce food for the people of the earth. It was more than 150 years ago this spring that he first placed his plow in commercial production and in no time since has the world needed the plow any more than now. John Deere was not a writing man. For a pen he used a heavy hammer. For paper he used sheets of steel. For a desk he used the mighty anvil. His autobiography is the plow. And a big part of his legacy is the John Deere Tractor company. Nest Dean's Blog is a participant in the Amazon Services LLC Associates Program, an affiliate advertising program designed to provide a means for sites to earn advertising fees by advertising and linking to amazon.com.